V12, Studio compressor from JDK Audio. JDK Audio announced the release of the V10 single-channel mic preamp and the V12 single-channel compressor. Both units are built in accordance with API’s 500-series modular lunchbox format. 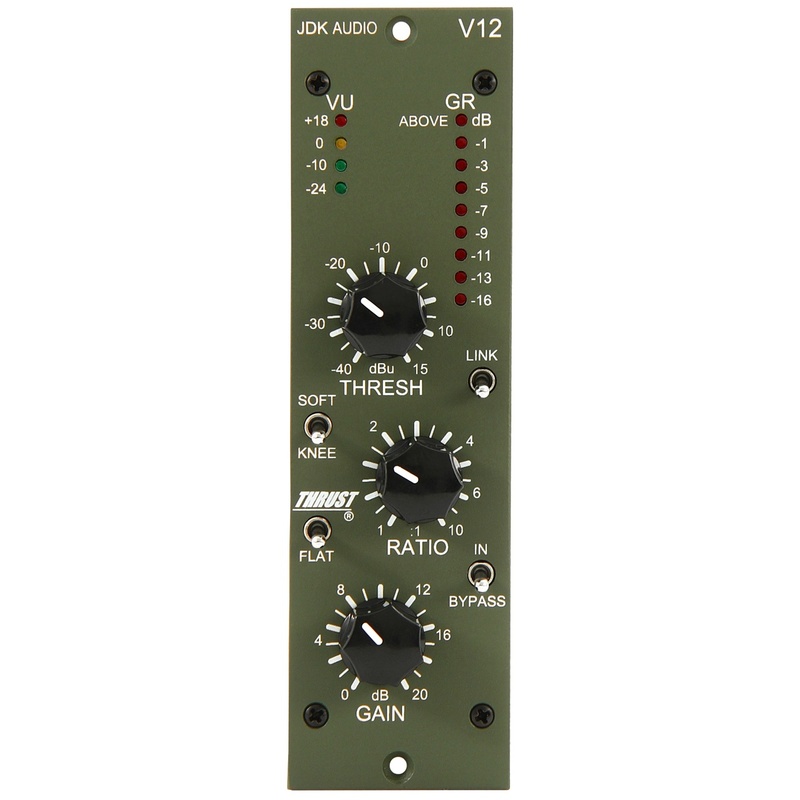 The V10’s circuit is identical to a single channel of the JDK R20 mic preamp, and the V12’s circuit is identical to a single channel of the JDK R22 compressor (itself a replica of the famed inline compressor on ATI Paragon consoles). JDK’s V10 is a mic and instrument preamp. It offers 54dB of mic-level gain, 45dB of instrument-level gain, phantom power, phase inversion and a pad which provides 10dB of attenuation on the instrument input and 20dB on the mic input. Metering is a multi-segmented LED with peak indication. 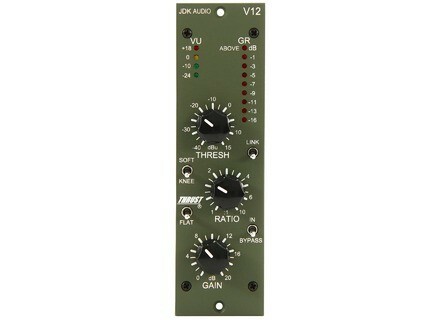 The JDK V12 compressor design is derived from the original ATI Paragon console and provides variable control of threshold, ratio and make-up gain plus switchable hard or soft knee compression modes. The V12 offers the “Thrust” circuit that is designed to preserve high-frequency content even under aggressive compression settings. LED metering is provided for both gain reduction and output level, and two V12 modules can be linked for stereo operation with true RMS summing of left and right signals. Both the V10 and V12 can be matched to the existing V14 single channel EQ, and the RRP of all three models is £549 including VAT for each unit. Blue Microphones Reactor Review The launch of the Spark, which we had the opportunity to review here, generated a lot of excitement. But Blue Microphones shows no intention of stopping there and has introduced a new microphone with a quite... different look?! Reactor enriches the product range of the US brand while staying faithful to the philosophy of offering affordable, but original products. Let's dig into the details. How to Acoustically Treat Your Home Studio Whether you’re a self-recording hobbyist or a professional mixing engineer, studio work is about making decisions. If the room you’re making decisions in isn’t a reliable listening environment, then the decisions you’re making won’t be reliable either. DAD AX32 Digital Audio Denmark introduced their new DAD AX32 audio converter.